Truth be told, I first started writing this article over a year ago, and it was a lot more bloated than this piece is. Over the past several years I took a particular interest in raptors, and specifically Buzzards, more than likely because they were the birds that I came across most often in the field. I really struggled with differentiating between them in the beginning, when younger birds were involved. Each time I saw an individual I would take a photograph and document its features, making mental notes of differences and subtleties. While I am no expert, at this point I would feel quite disappointed in myself if I were not able to correctly identify one of the Southern African Buzzards, regardless of its appearance. But this isn’t a definitive guide, and is merely my attempt to assist others using the methods I do – so take it with a grain of salt. I continue to see people struggling with the IDs on social networks and birding forums and decided to put together something that lists the things I look for when I am IDing the bird, in the hopes that it may help some. There are three colour morphs of Jackal Buzzard. The typical morph remains the most common, while both the dark and the pale morphs are rarer. The colour morphs are generally defined by the appearance of the chest band that extends across the body of the individual. In most individuals, this band is predominantly rufous in colour, with a presence of white and black. In the pale and dark morphs, this band can lack one or even two of the three colours. In dark morphs you will find that the chest band can be completely black. In pale morphs, there will usually be a lack of rufous colouring and will be mostly white. 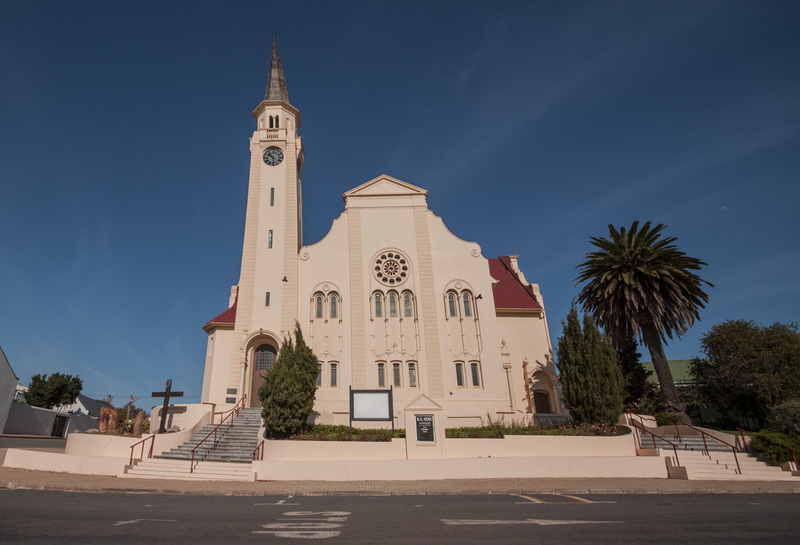 It is worth noting that there seems to be a larger presence of pale individuals in the Northern Cape and Namibia. An Immature Jackal Buzzard showing signs of adult plumage starting to develop. Juvenile Jackal Buzzard with light eye visible. Juvenile Jackal Buzzards tend to be for the most part brown, with some darker brown streaking on the chest and body, and can resemble a Steppe Buzzard. The tail of these juveniles tends to be white though may depend on the individual, as only some of the adult birds develop a defined sub-terminal band on the tail. 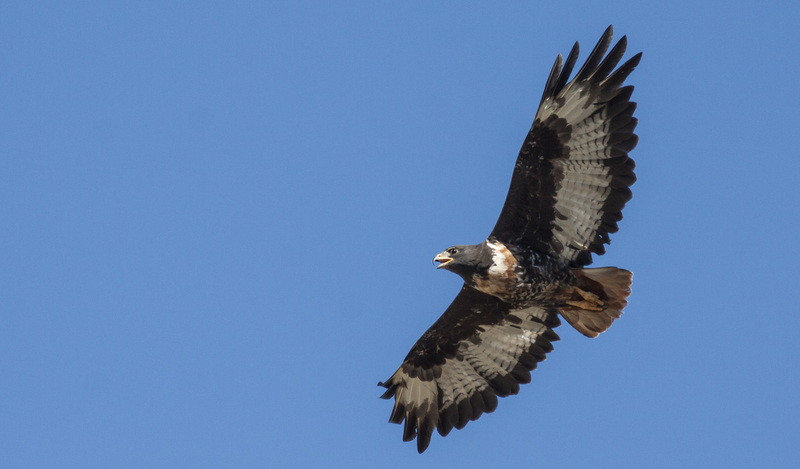 From the top, the upper wings may be hard to differentiate from a Steppe Buzzard, especially when perched – though if spread out you may be able to see signs of white developing along the tops of the primaries. The flight feathers on the under wings tend to be light with minimal light coloured barring often present, the trailing edge should be visible, though lighter than with adult birds. 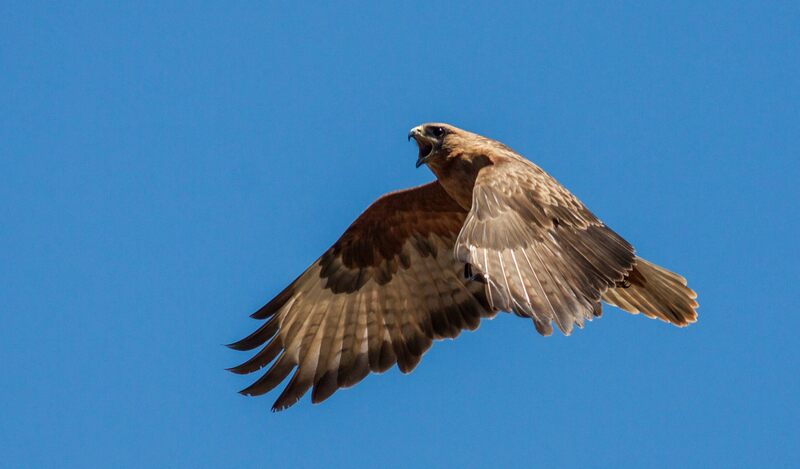 The under wing coverts of the juveniles tend to be of a caramel or washed out brown colouring. As with most Buzzards, the eye of the juvenile bird is very light. Immature Jackal Buzzards can be easier to identify, as adult diagnostic features begin to develop. Immature birds will often show signs of developing the darker adult plumage, with dark patches or blotches on the body. There may be signs of the rufous chest band starting to show through. The tail will often begin to show signs of turning a rufous colour, as they grow older. The eye will still appear light through most of the immature stage. 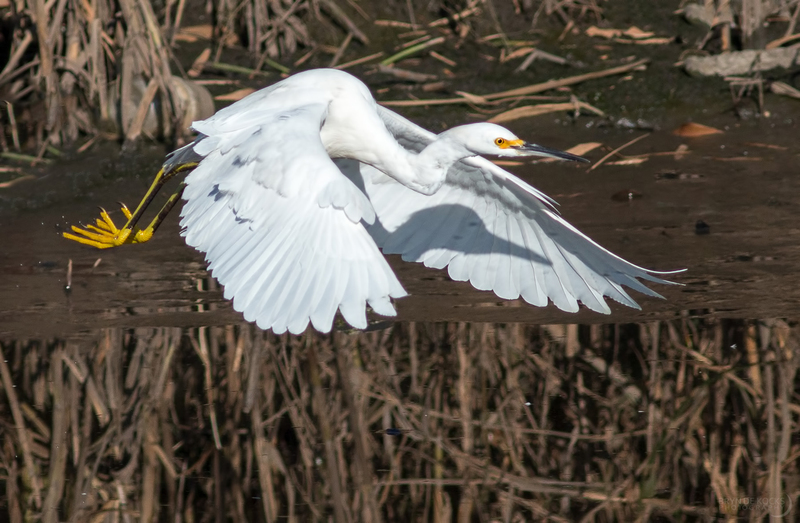 From above, the upper wings will also show more visible development of white along the flight feathers. Adult birds become much more easy to identify as they develop their slaty black bodies, and their chest band develops. The only time when there could be confusion between species with adult individuals, is when there is a pale morph individual that resembles a Juvenile Augur Buzzard, though these two species ranges only overlap in very small areas. For the most part, young Jackal Buzzards are easy to distinguish from most of the other Southern African Buzzards. However, Steppe Buzzards are very similar to many of the juvenile Jackal Buzzards and as such, I will attempt to document some of the ways in which I distinguish the two species. This is probably where I see the most people struggling with Buzzard IDs. Juvenile Jackal Buzzards can most certainly look like Steppe Buzzards, but there are usually a few ways to tell them apart. With regards to plumage, the coverts offer a lot of insight usually and looking for the caramel colour will often allow one to help differentiate between the two. The far edges of the primary coverts may also show signs of a darker brown which contrasts with the caramel. 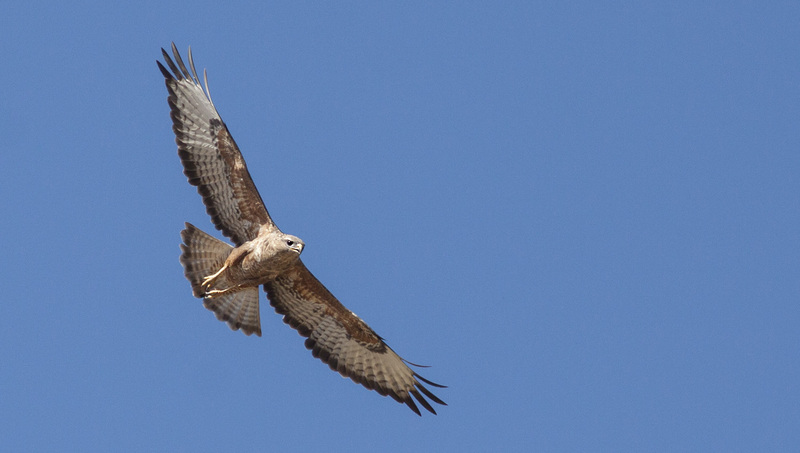 While Steppe Buzzards can have similar shades of brown on their coverts, a difference can usually be noted by taking into account the rest of the coverts colouring. Another key identifying feature is the shape of the wings. 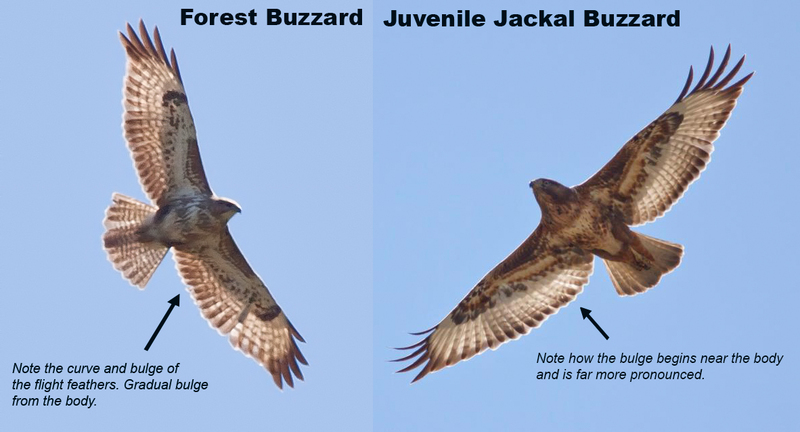 The Jackal Buzzard, even juveniles – tend to have a more bulging shape to their secondary flight feathers, while the Steppe Buzzard will mostly have a fairly straight wing in comparison. Also remember to look at the eye, adult Steppe Buzzards won’t have the same light eye colour as the younger Jackal Buzzards. In immature birds, as mentioned before – distinguishing between other Buzzards becomes easier and this is also the case when comparing the Jackal Buzzard to the Steppe Buzzard. Darker brown or even black patches on Immature Jackal Buzzards often allow for easy diagnostic features. The chest band will also usually show some signs of starting to develop and help further remove it from the Steppe Buzzard-like appearance. Carefully examine the tail for signs of rufous colouring developing in the feathers. The upper wings can also hold identifying factors; immature Jackal Buzzards begin to develop the white ‘vents’ on the top of the flight feathers, which contain barring. Look for signs of greyish barred feathers on the upper flight feathers. People may also occasionally become confused between Juvenile Jackal Buzzards and Forest Buzzards, which sometimes can appear quite similar. You can see in this image, that the area of the wing and the magnitude of the bulge in the secondary flight feathers between Jackal and Forest Buzzard. Two individuals that some could easily get confused between. Steppe Buzzards are migratory birds which with possible exception, come down to South Africa in the Spring and stay until late Summer to early Autumn. It is however possible that some individuals remain in South Africa over the winter period and the topic of over wintering Steppe Buzzards is an interesting one (view Mystery Buzzard below). The Steppe Buzzard is a species of bird that has what is possibly one of the largest variety in plumage out of all other raptors. There are two main morphs that Steppe Buzzards are classified into (Rufous and Grey), and even within those morphs the exact plumage differs greatly between individuals. To document the details of each possible appearance would be near impossible. 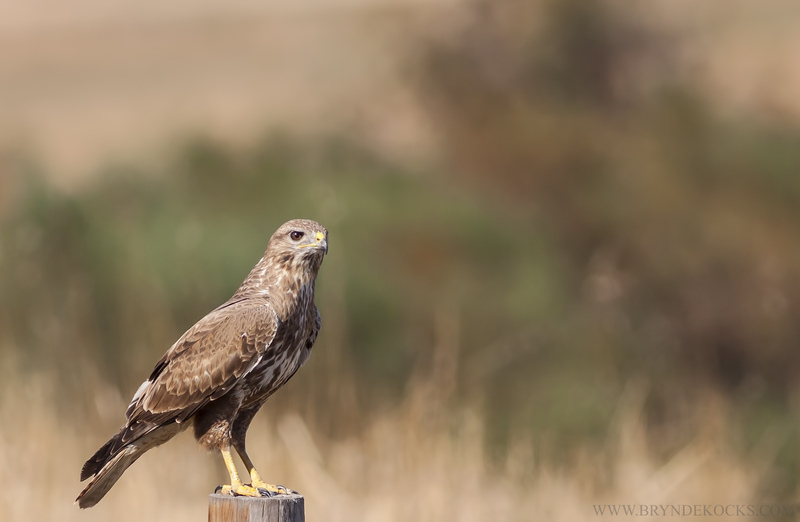 Steppe Buzzards, unlike Jackal Buzzards do not change that much in appearance through the aging process, and younger birds tend to look a lot like the older birds but often display much more of a streaked appearance, with the barring found in adults often only developing later. Another key to distinguishing them lies in the eye colour, as younger birds, as most Buzzards, will have pale eyes. Juvenile and Immature Steppe Buzzards may also show a less defined trailing edge on their flight feathers, though even the trailing edge is a variable factor in adult birds, with some being more prominent than others. A more unique Steppe individual showing a less commonly seen appearance, but showing the diversity of the morphs in this species. Steppe Buzzard showing more streaking on the chest than the classic barring one expects. 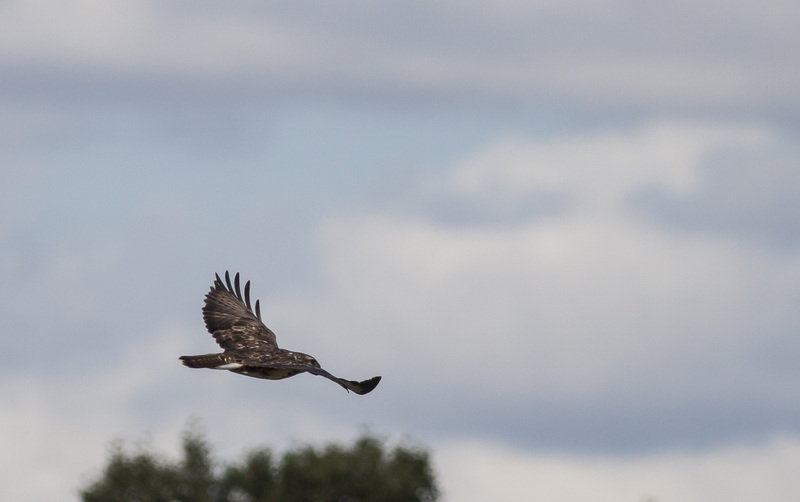 Steppe Buzzard in flight displaying the classic barring on the body, showing a prominent sub-terminal band. 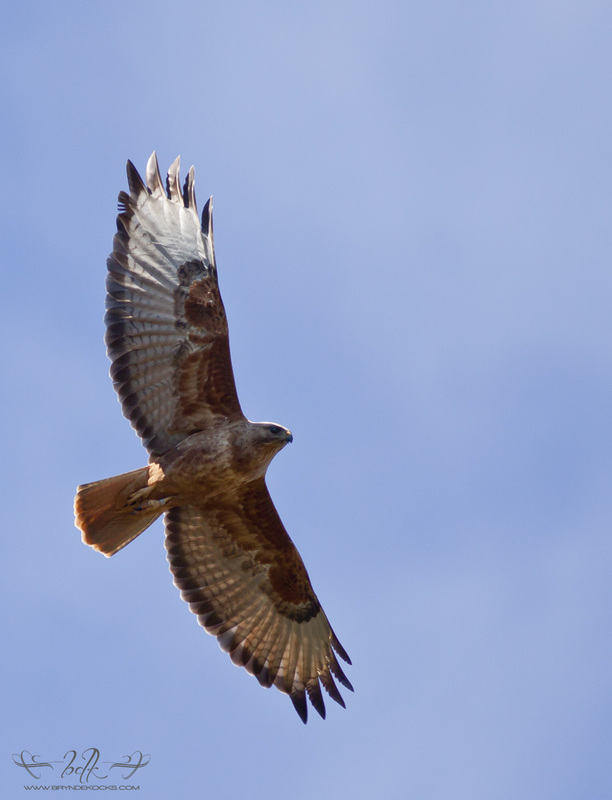 The second most common difficulty people run into with Buzzard identification (Mystery Buzzard aside) is the confusion between Steppe Buzzard and Forest Buzzard. The plumage of these two species can sometimes be quite similar. 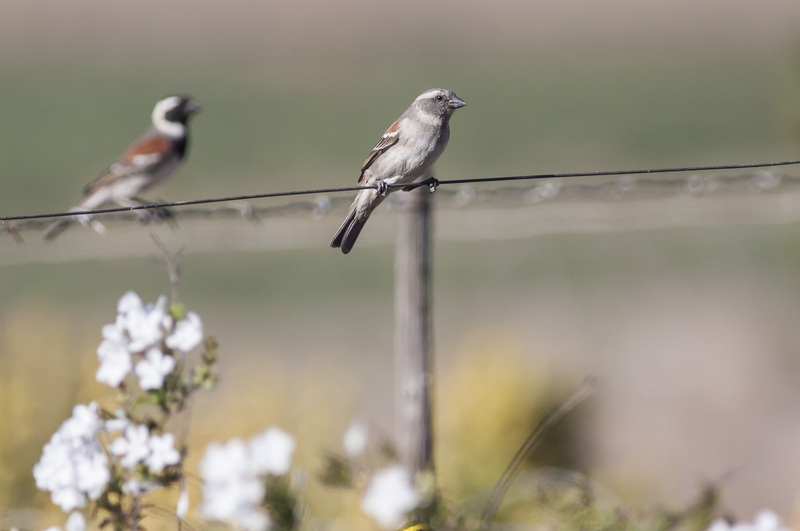 The first thing to look at, when attempting to differentiate between these two species, is to note the pattern of the markings on the body of the bird. 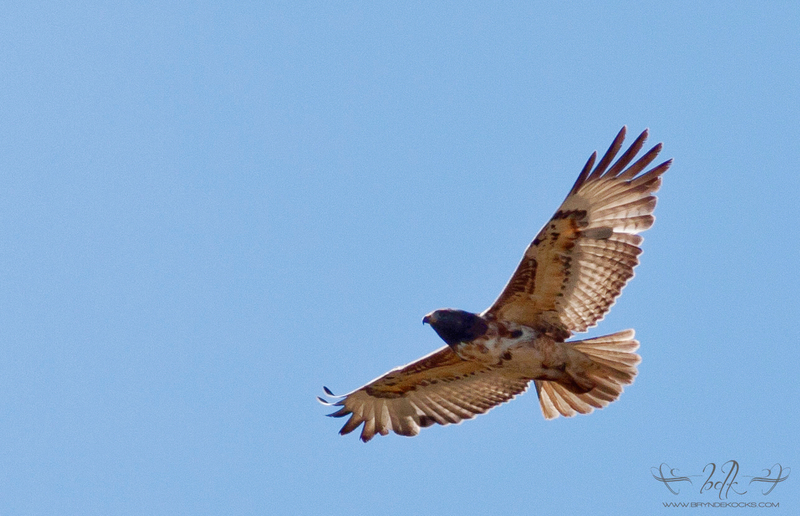 Forest Buzzards have tear-drop markings, and while some Steppe Buzzards usually show barring. The Forest Buzzard will tend to be a lot lighter overall and a Forest Buzzard will also never have barring of a Steppe. So while a young Steppe may show teardrop-like markings, the Forest will never show barring. The next thing to look at are the coverts; the coverts of Forest Buzzard are a lot more pale than that of Steppe Buzzards, when comparing both species side by side, it is easy to note that the amount of white present on the coverts of the Forest Buzzard is far more substantial than that of the mostly brown coverts found on the Steppe Buzzard. 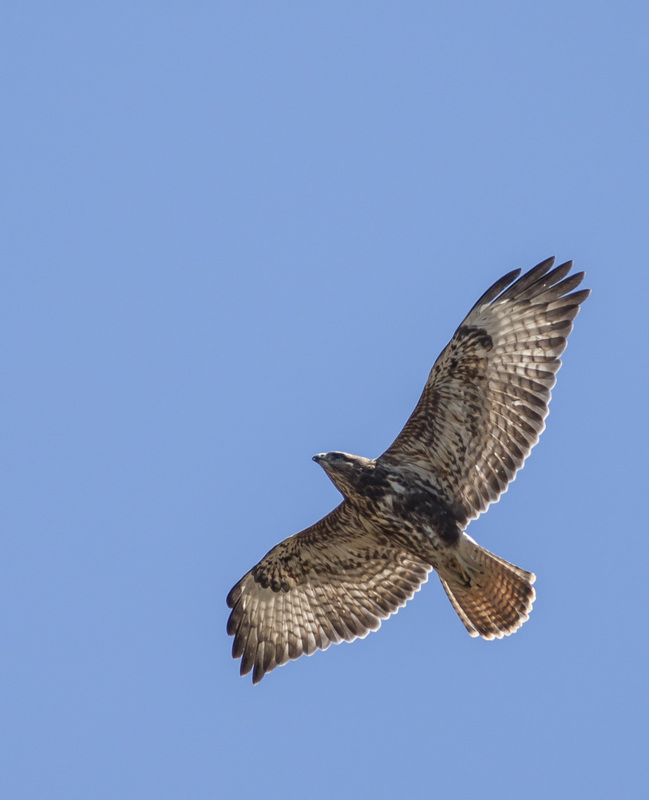 The white chest band that is sometimes present on Steppe Buzzards is typically a lot larger in Forest Buzzards. One should also compare the shape of the wings and the size of the body. Forest Buzzards tend to have a more bulky appearance than the more slender shaped Steppe Buzzard. The Forest Buzzard will also have more bulging on the secondary flight feathers than a Steppe Buzzard, along with slightly shorter wings. Forest Buzzard in flight displaying the very white body, as is commonly present. While certainly not fool-proof, it can also help to consider the habitat when making a call on these two species. Steppe Buzzards will far more commonly be found along road sides of empty fields, while the Forest Buzzard will usually be within range of a forested area. The Cape ‘Mystery’ Buzzard, also just called the ‘Cape Buzzard’ is an unconfirmed species of Buzzard which has been the center of quite a bit of controversy in recent years. It’s a resident Buzzard which looks in many cases identical to the Steppe Buzzard. Theories have been put forth over where the Buzzards come from and whether they are hybridized birds or not. At this point, despite research having been done on them, there is not yet a consensus on the answer. 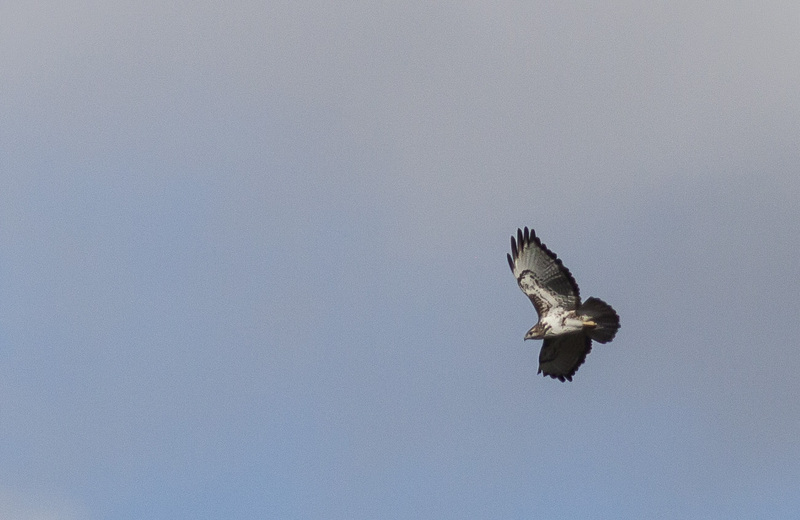 Are these just Steppe Buzzards who have over-wintered and become residents or are they something else? Hopefully time will tell, but all that’s for certain at this stage is that they’re a bugger to identify. 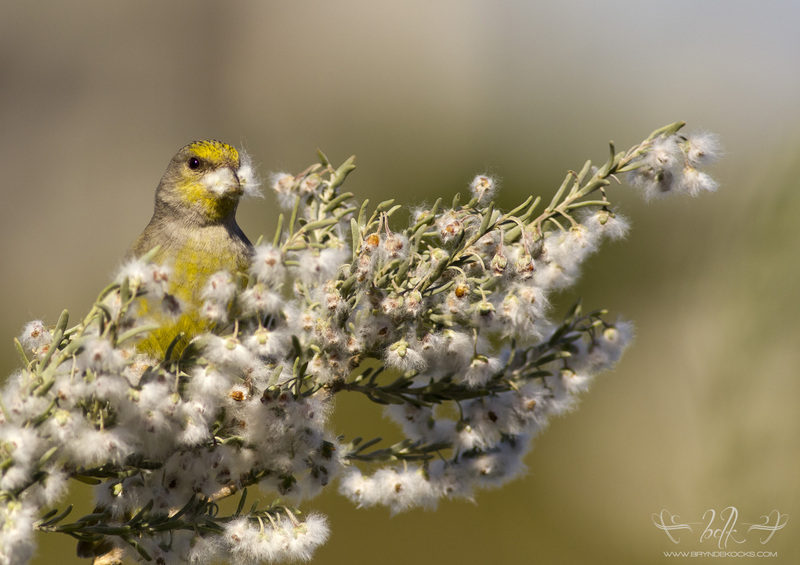 This was one of the breeding birds at Helderberg Nature Reserve. 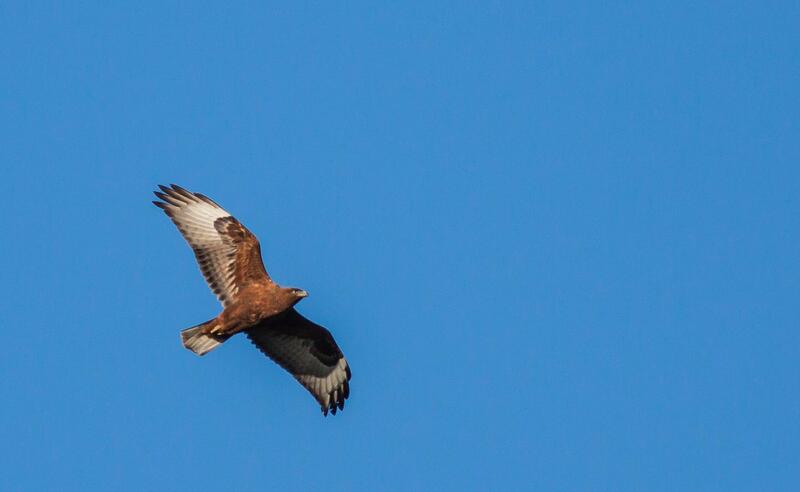 A full rufous/brown Cape Buzzard. One of the Juvenile Cape Buzzards, showing a very dark uniform “chocolate” appearance. 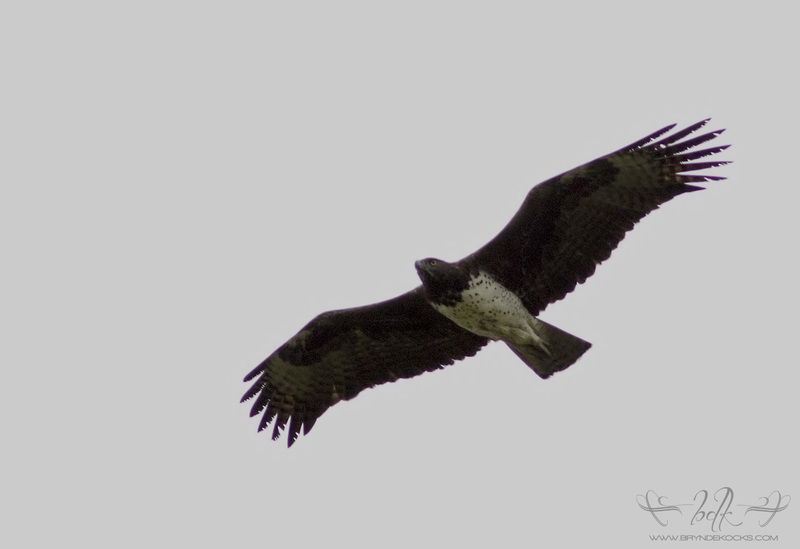 A Cape Buzzard taken in the winter near an area prone to Cape Buzzard breeding. This individual shows plumage very similar to a classic Steppe Buzzard. Like the Steppe Buzzard, the Cape Buzzard comes in a huge variety of morphs, some appearing identical to that of the Steppe Buzzard while others show uniform colouring, with both dark ‘chocolate’ coloured individuals and rufous individuals being documented. Identification is easier when you encounter one of the uniform coloured individuals, however when they show the same patterns as your average Steppe, it can sometimes be impossible to tell the difference. Steppe Buzzards do occasionally over-winter themselves, so while using the time of the year can be a good indicator as to whether it’s a Cape Buzzard or a Steppe Buzzard, you can’t always be sure. These Cape Buzzards have been documented through from the Cape Peninsula, through past Elgin and as far as Malmesbury. 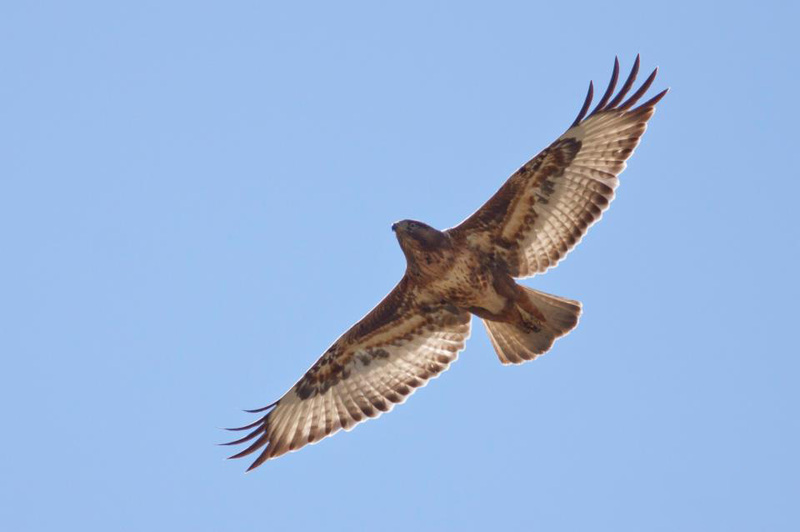 But should you encounter a Steppe Buzzard looking bird in the winter season, you are encouraged to report the sighting with an image to the Cape Buzzard Project. Hallo Bryn, thank you for this interesting piece. I saw a buzzard today and had exactly the problem you are describing here. I was able to take some photos in flight but unfortunately it was from quite a distance and therefore not perfectly visible. I am still having trouble identifying the bird. Would you mind if I send you a few photos? Maybe you can assist.